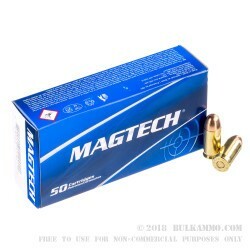 Newly manufactured by Magtech Ammunition, this product is excellent for target practice and range training with a reputation for quality. 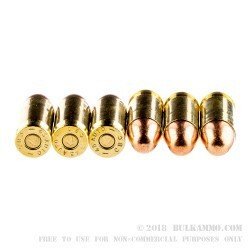 Each reloadable round boasts a brass casing, full metal jacket bullet, boxer primer, and non-corrosive propellant. Since 1926 Magtech ammunition has been producing reliable cartridges for shooting enthusiasts worldwide. Magtech ammunition is manufactured using state-of-the-art equipment in Sao Paulo, Brazil. Their manufacturing plant is vertically integrated producing their own powder, primers, brass, and projectiles which allows for tight oversight of quality at every step of the process. Due to their reputation for quality, Magtech Ammunition is now being exported to 50 countries around the world. Good ammo.. Went thru 2 inch wood.. Like butter! Good product, would recommend to friends and others. Super fast shipping! This is my first order, I will be ordering again. The case arrived with a little outside damage but the contents were perfect. 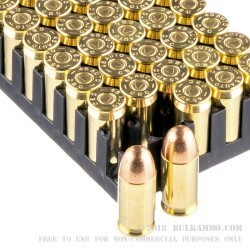 I have only fired around 50 rounds so far so my experience with this ammo is limited. The ammo is well made and packaged. It was 100% reliable in my Springfield 1911. It seemed very consistent, accuracy was good and it burned pretty clean. Overall a great product for plinking and the range. 1000 rounds of Magtech no problems. Great product at a fair price! A: Hello! This Magtech is all loaded with large pistol primers. Q: What is the velocity of this ammo. A: Hello Mike, These 230gr. FMJ rounds by Magtech have a muzzle velocity of 837 fps. They make great target rounds for your .45 ACP firearm. Q: Can I reload this ammo? 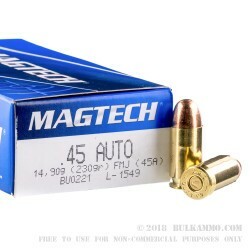 A: This 45 ACP ammo, along with any other caliber from Magtech, may be reloaded. The brass is boxer primed and factory new. Q: Is this ammo factory reloads? A: No, this Magtech 45 ACP is factory new ammo. Q: Where is Magtech ammo manufactured? A: Magtech ammunition was established in 1926 and is manufactured in São Paulo, Brazil.